Have you ever felt out of place simply because of the way you look? The color of your skin, your height, weight, hair style? Well meet Mary Elizabeth the Spotless Cow. She was so excited to meet some cows at her new farm, but as soon as they see she is spotless, they don't want anything to do with her.. just because she looks different. Mary Elizabeth concocts a plan and early the next morning goes to the local mud hole and puts 'spots' on herself. She tells the other cows they just appeared in the night. Now that she is like them, they play and have a fun day together as friends. As long as she has the spots, she is in the club so to speak. The following morning Mary Elizabeth washes off her spots before greeting the other cows, much to their surprise she says her spots went away over night. Well they turn back to their old ways and turn away from Mary Elizabeth. She points out the fun they had the day before when she did have spots, so why can't they have just as much fun if they went away? Will the other cows see her rational? My early reader daughter saw this book and just had to read it to me. She did great with many of the words, helping her through some like 'spot discrimination'. We have always had cows and love books that show their funny antics. This story I feel will help kids realize that what is important isn't the outside of a person, or cow.. but on the inside! The illustrations we very basic, but I do enjoy when the author is also the illustrator. That combination really gives the book more a cohesiveness. For the entire month of October you can get the $17.99 book for just $12.00 in celebration of the book tour! Another great perk? That the proceeds from the book go to Phoenix Children's Hospital Foundation. The story is actually a dream scene of Sweetles the dog. Funny how a dog dreams of cows, maybe like we dream of sheep. 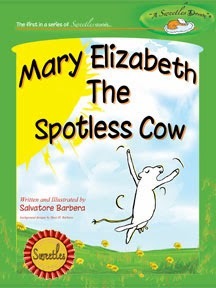 This books is for Animal lovers, children's book readers, Children's picture book readers, Humor lovers, book reviewers, anyone who likes books about friendship, tolerance and acceptance, books for young readers, books that teach a lesson, books that teach children a lesson, humor, Mary Elizabeth The Spotless Cow, cows, Phoenix Children's Hospital, Sal Barbera, Salvatore Barbera, virtual book tours.